Flooring is one of the most noticeable areas inside your home. Having attractive flooring not only helps bring together an interior design vision, but it also increases the value of your property. However, with so many choices available, narrowing down the option that best suits your needs can be difficult. For a versatile flooring material that fits well in virtually any design scheme and continues to perform, visit our fully stocked showroom for vinyl flooring in Colorado Springs, CO.
Are you looking to renew the look and feel of your home’s interior? 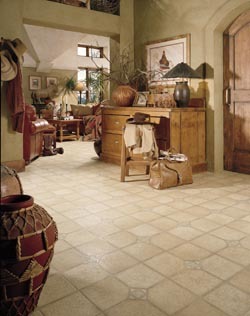 Attain the beautiful interior you long for with a surface underfoot that’s as stylish as it is cost effective. Give your interior atmosphere a warm and welcoming feeling with our stylish selections. At our flooring showroom, we carry a wide variety of vinyl tile flooring options that give your home a distinct look and feel. Whether you are remodeling one room or the entire property, we have what you need to complete vinyl flooring installation while respecting your budget and schedule. Vinyl is one of the most versatile flooring materials available today. Homeowners and contractors opt to install vinyl flooring for its adaptability, cost-effectiveness, and ease of maintenance. Manufactured with synthetic polymers, its non-porous surface makes it impervious to water. As a result, vinyl makes a great choice for kitchens and bathroom that experience an abundance of moisture. In addition, vinyl won’t stain easily so long as spills are cleaned up in a timely manner. This also makes this versatile material a great choice for areas of high traffic such as living rooms and dens. If you’re looking for an alternative flooring choice that continues to surpass your expectations, you can’t go wrong with a vinyl flooring installation from our skilled crew. Its flexibility in style can help you achieve the look of various other flooring materials when you need a material that’s as durable as it is affordable. As a homeowner, you want to ensure that you’re making a sound investment during any home renovation. In addition, if you’ve got family and pets to think about, it’s in your best interest to center your renovation around how well your choice of material can stand up to an active household. Not only does vinyl sheet flooring stand up strong to substantial foot traffic, but it can also withstand the impact of the occasional bump, stumble or dropped object. In addition, its single sheet layout means it can be cut to fit wall-to-wall or be made to fit around any feature you’d like to use as a focal point in your interior design. Feel free to browse our top-quality selections in a wide variety of patterns, designs, and colors. Once you are satisfied with your choice, we work with you to discuss your unique needs. Finally, we make sure to cut your vinyl sheet flooring selection to the size you need to make for simple hassle-free installation. We work hard to keep overhead costs low in order to pass the savings along to you. As a result, you are sure to receive designer floors and quality workmanship at respectable prices. Our sales representatives are more than happy to help you find the option that best suits your design goals. Thanks to modern manufacturing advances, vinyl tile flooring can be made to mimic the look and feel of many other traditional flooring materials, such as stone, porcelain, and travertine. Count on our specialists to help you field our expansive inventory to find a selection the best fits your aesthetic preferences and performance needs. With a number of popular brands available, including Armstrong™ and Mannington™, you are sure to find a choice you can be proud to feature in your home. Hardwood is heavily sought by home and business owners for its timeless appeal. Few things can match the classic beauty that real hardwood possesses. However, if you’re looking to emulate the look of real hardwood on a budget, vinyl plank flooring is fantastic flooring choice. Specially manufactured to recreate the look of real wood grain, vinyl planks mimic a variety of different wood types. As a result, vinyl planks make for a cost-effective alternative to solid hardwood floors. If you want the remarkable look of solid hardwood flooring at a fraction of the cost, look no further than our fully stocked showroom. Made to mimic the look of various grains, patterns, colors, and stains, these floors offer the look and performance you need for less. Simply share your design aspirations with one of our amicable sales representatives and we’ll provide you with a plethora of affordable plank flooring options ready to install. You deserve to have your new floors as quickly as possible. For this reason, our company offers professional installations to help you complete your renovation. Count on us to lay your new investment perfectly into place. Our trained and experienced vinyl flooring installation team takes every step necessary to ensure your new purchase lasts beautifully for years to come. Our installation team is available for service at your convenience. At your request, our sales representatives are prepared to work with you to pick a design and coordinate your installation according to your schedule and budget. Afterward, our vinyl flooring installation team will travel directly to your location to complete your project in a timely manner. Put your home renovation project in the hands of trustworthy professionals. When we arrive at your location, we work to efficiently remove your old flooring and make the necessary preparations for your new installation. When you put our team to work for you, we don’t consider our job done until we’ve earned your complete satisfaction. Contact us today to learn more about inventory of affordable vinyl flooring. We proudly serve clients in Colorado Springs, Monument, Palmer Lake, Security, and Widefield, Colorado.